A pair of mating Queen butterflies (Danaus gilippus). When female butterflies first emerge, they already have about 400-700 eggs inside their abdomen. Most butterflies have a very short adult lifespan of three to four weeks. Females must quickly find a mate to have enough time to lay all her eggs. I was trying to get a nice shot of this female Spicebush Swallowtail (Papilio troilus) when the male swooped in after the female. When female butterflies first emerge, they already have about 400 to 700 eggs inside their abdomen. Most butterflies have a very short adult lifespan of three to four weeks. Females must quickly find a mate to have enough time to lay all her eggs. Crimson Patch (Chlosyne janais) butterflies are found from Colombia north through Central America and Mexico to southern Texas. Depending on the species, but usually within three or four days, the female will be ready for romance. But the female butterfly is picky. She wants just the right male who will provide just the right quality offspring. White Peacock (Anartia jatrophae) butterflies are found in the southeastern United States, Central America, and throughout much of South America. 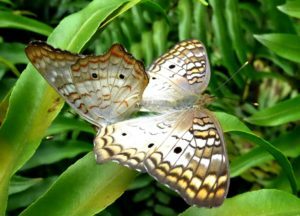 The male, in order to entice the female butterfly, will perform a courtship dance. These “dances” consist of flight patterns that are peculiar to that species of butterfly. If the female is interested she may join the male’s dance. The two flutter and twirl through the air together. The male releases pheromones, a natural cologne, from scent glands in an effort to entice the female to mate. 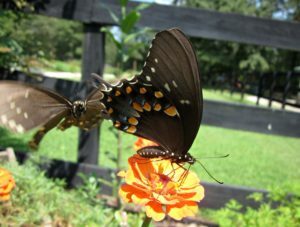 Giant Swallowtails (Papilio cresphontes) are the largest butterfly found in North America. 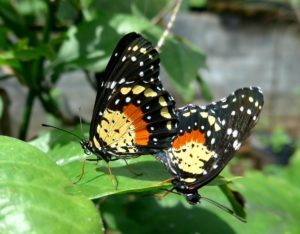 Once the female is satisfied with her suitor, she allows him to attach himself by extending and offering her abdomen towards the male for coupling. 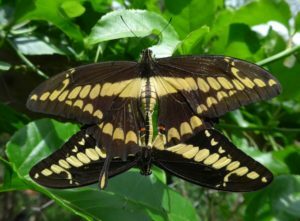 The male butterfly has a pair of claspers at the end of his abdomen used to hold onto the female during the mating process. Males and females lock together at the ends of the abdomens and may stay attached for anywhere from an hour to up to twelve hours or more. In this way, males ensure that they are the only ones who fertilize the females’ eggs. During mating, males provide a spermatophore, a sort of “package” of sperm and nutrients the female needs to produce and lay eggs. Just as with humans, the mating rituals of butterflies can be perplexing. I have seen some unusual behavior among butterflies inside butterfly exhibits. One day I walked inside the butterfly house to find several male Zebra Longwing butterflies flying wildly around a newly emerged female Black Swallowtail. I suppose the males were confused and misread the olfactory clues that they use to find females. 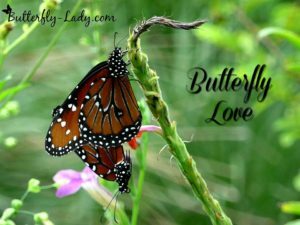 The next time you see that “love is in the air,” quite literally, you’ll know more about the birds, and the bees, and the butterflies. 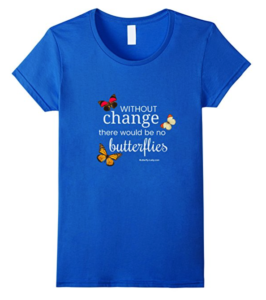 “Without Change There Would Be No Butterflies” T-Shirt. Sizes for Women, Men, and Youth in five different colors. Click Here or on the photo to see more. This entry was posted in Butterflies. Bookmark the permalink.